An alumnus of the Children's Chorus of Greater Dallas, Bethany Ring joined CCGD as Concert II Chorus Assistant Conductor in 2013. She is currently Choral Conductor at Greiner Fine Arts Academy in DISD. 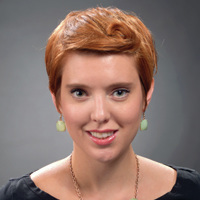 Previously, Ms. Ring serves as Director of Choral Activities at Cain Middle School in Rockwall, TX, and assistant director for the Greater Baton Rouge Children's Chorus (Baton Rouge, LA), where she shared responsibility for conducting rehearsals and performances, artistic planning, and auditioning. Ms. Ring has conducted the Louisiana State University (LSU) Chamber Singers and the LSU Symphony Orchestra. She is currently singing with the Orpheus Chamber Singers and was previously a member of the Baton Rouge Early Vocal Ensemble (BREVE) for four seasons. Ms. Ring holds a Bachelor of Vocal Music Education degree and a Master of Music in Choral Conducting with a secondary emphasis in orchestral conducting from Louisiana State University. She holds membership in the American Choral Directors Association, having served as president of the LSU chapter in 2010 and 2011.